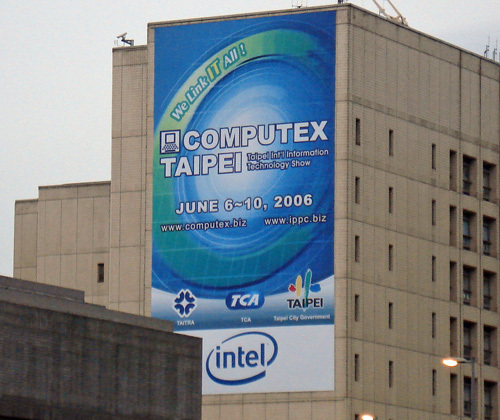 We have recently returned from Computex 2006 with our heads still spinning after viewing literally thousands of products from a multitude of suppliers. We already provided some pre-show coverage, but there's still lots more to see and talk about. This year's show was a general success and while several companies were launching new products in different market segments, the talk of the town was Core 2 Duo (Conroe) and AMD's expected response. AMD's first response in the short term very well could be the purchase of ATI; whether this truly makes business sense for either party is up for debate considering ATI's close relationship with Intel and AMD's long term partnership with NVIDIA, but privately representatives from both Intel and NVIDIA told us they were already discussing the potential effects of this merger internally. While the focus of the latest Computex was definitely on Core 2 Duo products, we did see a significant amount of AMD AM2 products with the low to ultra low end being dominated by VIA and SIS. However, we were told by several motherboard suppliers that NVIDIA plans on aggressively pursuing the upper low end range of the AM2 market with expected board prices for the micro-ATX GeForce 6100 boards reaching US $53 and nForce4 ATX boards reaching US $60 price points in the near future. Several of the manufacturers told us that NVIDIA is offering incentives on the nForce4 Ultra chipsets in order to move out this inventory, and we noticed a significant amount of AM2 boards based on this chipset and very few on the nForce 550 at the low end of NVIDIA's AM2 product roadmap. While NVIDIA does not appear willing to go after (at this time) the under US $50 market, the fact that they will be creeping up on this price point is sure to place additional pricing pressures on VIA and SIS at the top of their product ranges. ATI's market plans in the AM2 segment were a little less clear as very few suppliers were showing the Radeon Xpress 300 or 1100 micro-ATX boards, essentially a Radeon Xpress 200 Northbridge (X300 integrated graphics) with DDR2 support and either the SB460 Southbridge in the 300 or SB600 Southbridge in the 1100 series, with price points starting around US $65. It appears at this time ATI will be offering the Radeon Xpress 1100 with an X16 PCI-E slot as an answer to the nForce 570 Ultra product around the US $75~$90 price point. The emphasis is clearly being placed on the Radeon Xpress 3200 (RD580/SB600) boards with planned price points from US $125 to $200. Hopefully, some of these Xpress 3200 product offerings will drop to the US $90 to $125 range to compete with the excellent nForce 570 SLI product range; if not then NVIDIA will continue to dominate in the mainstream market space. One of the more pleasant surprises of the show was the rejuvenation of Abit. While we knew they were on the road to recovery, we did not expect the product lineup they displayed. 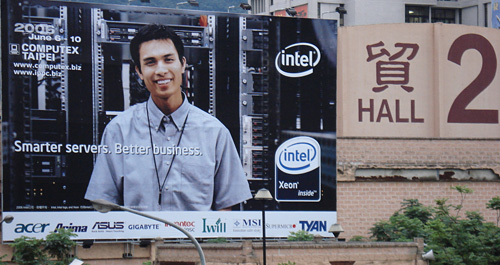 Abit was at one time the top manufacturer of enthusiast level boards that catered to the overclocking community. However, Abit found itself in serious trouble over the past couple of years, and for all intents and purposes it was close to ceasing business operations. Fortunately, Abit entered into a long-term partnership with USI this past January that ensures their financial health for the foreseeable future. This strategic partnership also signals a return of Abit to their roots as a company driven to provide the computer enthusiast and extreme overclocker with the highest performance solutions available. We spoke at length with Abit's PR managers David Jarlestedt and Peter du Preez about Abit's upcoming motherboard product lineup, the new Universal Abit branding strategy, and their entry into the Media Center PC market with the ViiV certified IL80-MV motherboard and new iDome digital speaker series. Let's take a closer look at Abit's new products along with those from Biostar and Thermaltake. Does anybody know when we can expect to begin seeing Socket AM2 motherboards based on RD580 in the retail channels? I'm still waiting for the M2R32-MVP. agree. In fact, I avoid any product that has the Fatal1ty name on it, no matter how good it looks. All of these companies think gamers slobber over the name Fatal1ty, when in fact they don't give a crap. We want quality products, not marketing pieces. I agree also, this is all marketing and you will see more FataL1y products from Zalman and others in the near future. I would just assume Abit use the color scheme on the boards, add a couple of PCI slots, lower the price, and call it a day. However, these companies assume his name has leverage in the marketplace, whether it does or not, only Abit and others will know at the end of the day. All of these new, useless, over-priced mobos are intended for what? As noted by others, the mobos don't have a practical number of USABLE PCI slots, the prices are way excessive, you can bet they will have long lists of defects based on virtually all Asian designed consumer mobos shipped in the past three or more years and there will be little if any customer support for the malfunctioning mobos customers will be stuck with if they purchase these POS. Instead of fixing the defective mobos properly the mobo companies will crank out new POS to great fanfare by the hardware review sites. The PC world is increasingly becoming a common consumer item, and seems just a few years away from joining VCRs and microwave ovens as disposable-when-broken houseware. Conroe and the K8L seem like logical, traditional progression along the better/faster/cheaper curve. But now we're looking at 1000W power supplies? How will the PC gaming developers handle this, with a smaller-and-smaller piece of the overall video gaming pie requiring such power-hungry and expensive toys?